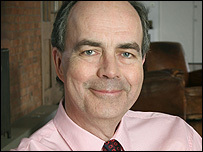 The presenter of BBC Radio 4's The World at One programme, Nick Clarke, has died of cancer, aged 58. Clarke was diagnosed with cancer last year, and had to have his leg amputated during treatment. He kept a frank and moving audio diary about his operation and chemotherapy, which was broadcast on Radio 4 in June. 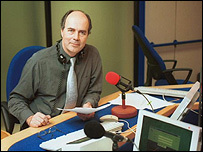 Prime Minister Tony Blair led tributes, calling Clarke a "true professional" who "represented the best elements of public service broadcasting". BBC News head Helen Boaden said: "Nick was a superb journalist. It's hard to imagine Radio 4 or BBC journalism without him." "He had a brilliantly forensic mind, a wry wit and a deep instinct for the power of language," she added. As well as presenting The World at One, Clarke also chaired the Round Britain Quiz and the debate series Straw Poll. He was born in Godalming, Surrey in 1948, and educated at Bradfield College, Berkshire and Fitzwilliam College, Cambridge where he studied modern languages. After a career in newspapers, he joined the BBC in 1973 as an industrial correspondent before moving on to the Money Programme and eventually joining Newsnight in 1984. He began presenting The World At One in 1989, and was voted Radio Broadcaster of the Year by the Voice of the Listener and Viewer in 1999. Clarke also published two books, a best-selling biography of the veteran writer and journalist Alistair Cooke, and a critique of modern Britain, Shadow of a Nation. Colleagues called Clarke "the consummate radio broadcaster". Clarke's colleagues at the BBC have paid tribute to the journalist, with chairman Michael Grade calling him "one of the outstanding broadcast journalists of his generation". "I am deeply saddened by this news," said director general Mark Thompson. "Nick was not only a terrific colleague, but also a great friend, whom I worked with over a number of years. "He was one of the BBC's finest broadcasters and a brilliant political interviewer, who was also a great listener. Nick's interviewing style was penetrating but unfailingly courteous." Foreign Secretary Margaret Beckett, who knew Clarke well, also paid tribute. "Nick Clarke was an inspiration to many not only in his professional life but also in the way he battled to overcome his illness," she said. World At One editor Colin Hancock paid tribute to his colleague, calling him "the most brilliant interviewer I've ever known". "He had an instinct for exactly the right approach, every time - never hectoring or offending, always probing in precisely the right areas. "More than that, he absolutely believed that everything we did on The World At One mattered, inspiring all of us to think more rigorously and chase harder." Clarke is survived by his wife and twin sons, as well as three children from a previous marriage.